You may have been redirected to this new location for this post...due to extremely poor performance of Wordpress on GoDaddy after a supposed "upgrade", the Wordpress version of my blog has been moved here....enoy the post! Aesthetic Exposure Triangle by Michael P. Young is licensed under a Creative Commons Attribution-NonCommercial-NoDerivs 3.0 Unported License. One of my past "lives" was being a software developer. Within the software/IT project world, we would always talk about the project triangle to clients. Each side of the triangle represented Time, Scope, and Resource Cost. For any change you made in one side of the triangle, and offsetting change would need to be made to another side..or a proportional change shared amongst the other sides. So for example if a project needed to have a time of 6 months for a given set of technical objectives, then the resources needed would be 5 people. If someone wanted to to shorten the time from 6 months down to 3 months, then either you add more resources (increase costs) or reduce the number of technical objectives of the project. With photography, we have a similar triangle. Each side of the triangle represents an "ingredient" in the amount of light contributed to the overall exporsure of a given scene. The longer the side of the triangle, the more light contributed. If you increase/decrease the length of one side of the triangle, you must equally decrease/increase, respectively, the length of another side, or split the change proportionately between the other two sides. your shutter speed to be faster to freeze motion. You know if you change your shutter speed to 1/500, you are decreasing the light to the exposure by 3 stops. Therefore you will have to increase another side equally, or share the difference between an increase in the other two sides. You could change the ISO from 200 to 1600. For some cameras,this would cause in inordinate amout of grain to the picture. Or, if your lens is capable, you could change the aperture to f/2.8. This would blur the background much more, which usually makes your sports subject "pop" out from the scene (a good thing)..but your focus point needs to be "dead-on" when tracking the subject as the DOF (depth of field) is very shallow. Instead you may feel better about changing the ISO 2 stops and the aperture 1 stop (ISO=800 and aperture=f/5.6). 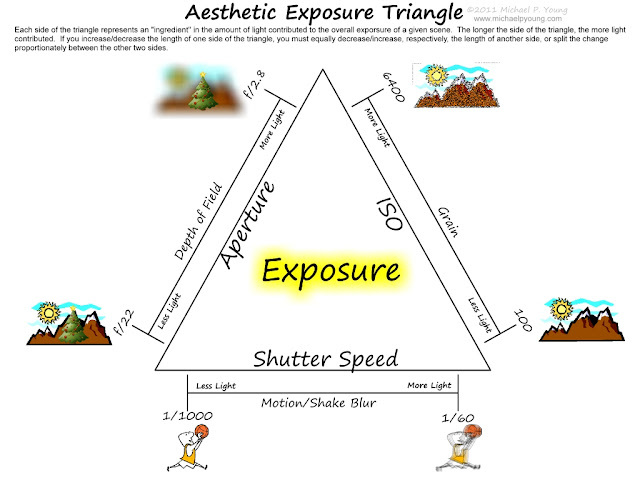 The Aesthetic Exposure Triangle tries to give the beginning photographer a graphical represenation of how manual changes to an exposure will affect the aesthetics of the resulting picture. 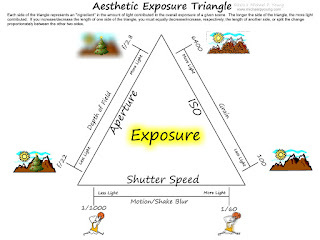 Many times, one will keep one of the sides of the triangle constant...so for example, you may have your camera set to aperture priority...the diagram can tell you how the "look" of the picture will be affected as you change shutter speed or ISO. Same with if you have the camera in Shutter Priority...how will the "look" of the resulting photograph change if you change aperture or ISO. Often times you may just know that you want to start of with a particular ISO (let's just say 200 iso)....when you meter in camera you can see what your camera's best guess is and then change the "ingredients" of aperture or shutter speed to get an certain aesthetic quality.